Because of my history and relationship with food it’s easily to get overwhelmed. When I find myself in these weekend over indulgence predicaments, I remember that this is only a few days in my life. However, it is hard to say no to cookies, but I find that if I enjoy ‘treats’ every day, I never feel deprived not do I feel like need to go overboard when I find myself at parties. It’s one way that I’ve found balance in food through this crazy food-obsessed society (hello, I’m apart of it!). 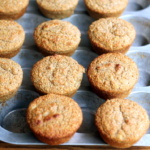 One of my favorite every day treats as of late have been these gorgeous healthy gingerbread muffins. I made them a few weeks ago when the snow has forced me to stay in. 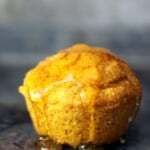 Our home quickly filled with a ginger molasses aroma as the muffins rose in the oven. When I pulled them out and noticed their beautiful sugar crusted tops, I couldn’t help but gobble two piping hot muffins up immediately. The muffins are wonderful for anyone who LOVES all things gingerbread or even molasses ginger cookies. The muffins themselves are incredibly soft and fluffy, similar to cake. Yet they don’t feel heavy at all; they’re made with whole wheat pastry flour (my fav! ), pure maple syrup, blackstrap molasses and cozy spices like cinnamon, ginger and allspice. These muffins would be lovely to bake up on Christmas morning, or anytime you need a treat. I love them the most with a cup of coffee. I hope you LOVE these as much as I do! If you make these, please leave a comment below letting me know how you liked them, or upload a photo to Instagram and tag #ambitiouskitchen! 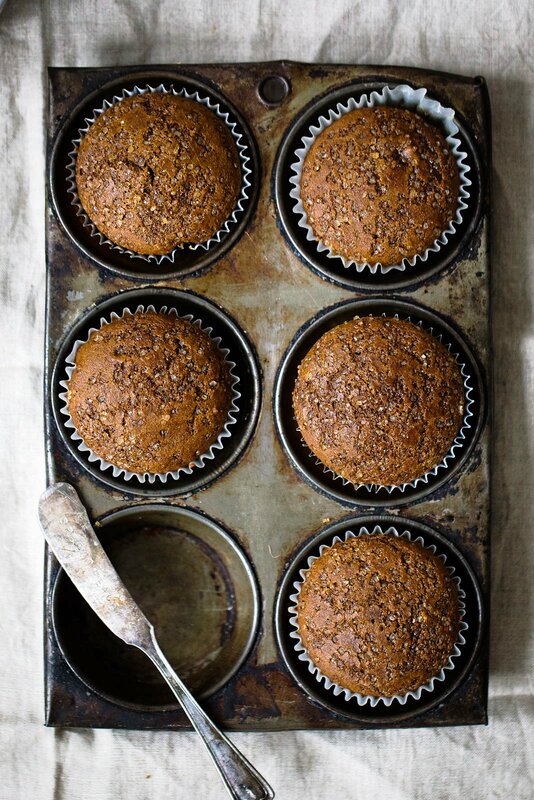 Healthy gingerbread muffins that are incredibly fluffy, warm and perfect with a cup of coffee. 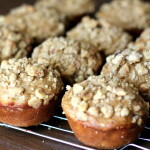 One of my favorite muffins to enjoy during the Winter. Preheat oven to 350 degrees F. Line a muffin tin with muffin liners; spray the inside of the liners with nonstick cooking spray to ensure the muffins do not stick. In a separate bowl, add coconut oil, maple syrup, molasses, egg, vanilla, yogurt and almond milk. Whisk together until smooth and well combined. Add dry ingredients and mix until just combined. Pour batter into liners, filling about 1/2 of the way full. Sprinkle with a little coarse sugar (this will create a beautiful muffin and a delicious crunch on the outside). Bake muffins for 18-22 minutes until a tester comes out clean or with just a few crumbs attached. Makes 12 muffins. Enjoy with a cup of coffee! 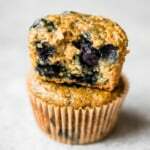 To make muffins vegan: Instead of an egg, replace with a flax egg (1 tablespoon flaxseed meal + 3 tablespoons water). To make dairy free: Sub coconut, almond or soy yogurt for the greek yogurt. Feel free to use white whole wheat flour or you can use half whole wheat and half all-purpose flour. 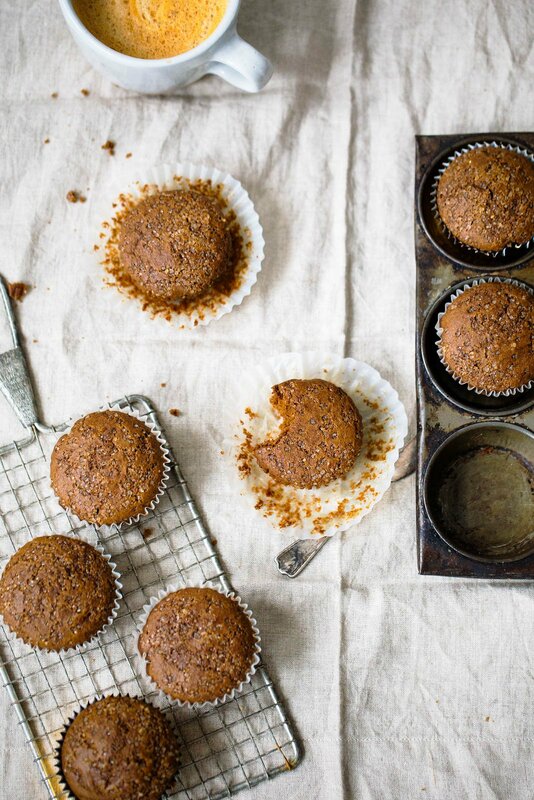 67 Responses to "Healthy Gingerbread Muffins + video!" Kinda obsessed with the thought of diving into one of these on a snow day. Such a good recipe! YUM. Forgive me if this is a stupid question but is there a big difference between whole wheat flour and pastry flour?? Whole wheat flour and whole wheat pastry flour are similar but different in texture and color. Whole wheat pastry flour has a lower protein that regular ww flour, which will make your baked goods come out light and fluffy instead of dense. It’s just as nutrient dense as regular ww flour, so I highly recommend it! I should’ve used pastry four…mine were a little dense! But still very flavorful and delicious! LOVED the ginger, molasses cookies too. Thanks for the healthy recipes! can I use Honey instead of maple?? These sound perfect. Planning to make them for Christmas brunch. My love for blackstrap molasses is REAL. Mixed it into my oatmeal this morning with cacao and banana. Yum! I had all of the ingredients already and it’s cooling in the kitchen! It smells delicious! I baked it as a loaf and can’t wait to dig in. It tastes delicious! I can’t believe it’s so healthy! Would you recommend using a cup for cup blend to make these gluten free? These look wonderful! I love all the ingredients you used. Thanks for the recipe! These were very tasty! My kids loved them. Thanks for the healthy christmas recipe! 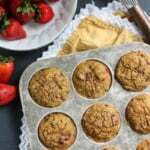 Can I use gluten-free baking flour instead of whole wheat? I think that might work well! 🙂 I haven’t tested it though, so I can’t be certain. WOW! These look so airy and fluffy, and I ADORE gingerbread flavors. Definitely perfect with a cup of coffee 🙂 Can’t wait to try! I haven’t tried it but I’m not sure that it would work well. I’m sorry! can almond flour be used? I made them yesterday and they tasted so good. They actually made the whole house smell delicious. 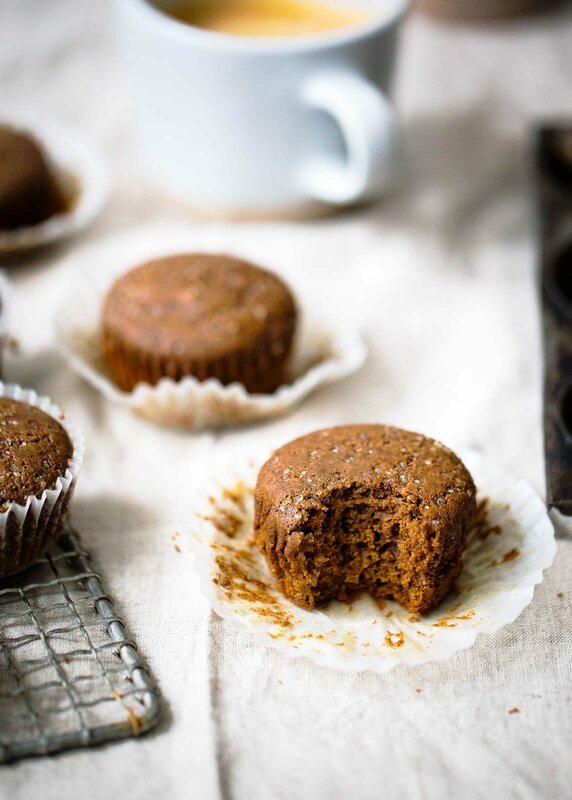 Looking for gingerbread muffins to make with my toddlers and 2s class and what do I find but Healthy Gingerbread Muffins by Ambitious Kitchen. No need to look further for something delicious AND HEALTHY. I know I’ll find it here. Thanks again Monique. I usually make a gingerbread trifle for Christmas and I’m thinking of swapping the gingerbread that goes in the trifle for a few of these muffins broken up- would that work do you think? The trifle is made up of a cranberry compote and white chocolate lemon cream as well. Yes, I think that would work amazingly! These look so wholesome and delicious! A great yummy way to balance all of the indulgent holiday treats. Can I use canola oil instead of coconut? Yes, you can! :) I did so and they turned out perfect! Followed the directions above and these are perfect, not too spicy from the ginger and a nice crust on the top. Another one in the books for the Muffin woman! Just made these and they are divine! I couldn’t believe how easy they were! They are going into heavy rotation. Thank you so much! I can’t tell you how much I love these muffins! They taste so unhealthy and rised so wonderfully and are so fluffy, even though I used all whole wheat flour! Thank you so much! These are amazeballs. I make them when I get down to the last egg in the box and then I throw them in the freezer for quality snackage. Wonderful recipe! Went out on a limb and mixed all the wet ingredients with a large, chopped up carrot, and a cup of golden raisins in my blender (I am too lazy today to hand-grate my carrot!). Everything else in your recipe I followed exactly. And it was AMAZING! Next time I make these I think I’ll throw in some walnuts, too. I’m positive your original recipe is just as if not more amazing, but I like to throw in veggies and other healthy options as much as I can into recipes! These are awesome! I added an extra egg (white only) and used 1 1/4 cup whole wheat flour as opposed to 1 1/2. So fluffy! These muffins were delicious! They are so fluffy! I followed the recipe exactly, and will definitely be making them again! I went out and bought all the ingredients to make muffins and they turned out to be fabulous! These muffins are so moist and scrumptious. I just love them. 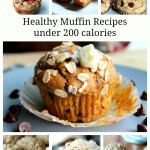 There so easy to make and a great for on the go breakfast with your coffee. I loved them so much I am making a batch for my co-workers. Thanks Monique! So happy to hear that Maria!! One of these with a cup of coffee is my fav combo 🙂 Hope your co-workers love them too! I loved these! I used half wheat flour, half almond flour. A hit with everyone. I kept them in a Tupperware on the counter and saw little mold spots after a couple days… a guess they need to be kept in the fridge? Also, other than spraying liners, any tips on preventing sticking? I’m glad the flour subs worked out for you! I’d suggest moving them to the fridge after a day or two just in case – the moisture can really vary. Give those liners a really solid spray! Absolutely delicious! 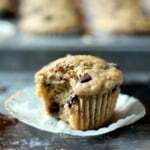 The texture of these muffins were spot on, and I loved how the muffins are only lightly sweet. Definitely going to be a regular breakfast with coffee in the morning! Love it! Any advice how long these stay on the counter or in the refrigerator? Can these be frozen individually in foil and warmed up in the microwave? Love these with a cup of coffee in the morning! These should stay good for a couple of days on the counter, and about a week in the refrigerator. You can definitely freeze them and warm them up later, too! These were absolutely wonderful! Both of my children begged for another! Going to make them again for Christmas morning! These sound delicious! Has anyone used a GF flour & had success? If so, what exact flour did you use? TIA. I used Bob’s Red Mill 1:1 flour worked great! I made these using regular whole wheat flour (since stores around here didn’t have the pastry variety) and they were still very light and fluffy. I think next time, I’ll bump up the spices. Quick question: Vanilla is listed as an ingredient, but I don’t see it in the recipe itself. Did I miss something? Should it be used? Thanks for the yummy recipe! Perfect! And thank you for the catch – I’ve added it to the instructions (just mix in with your wet ingredients). Enjoy! These were AMAZING. The description said something about allspice but the recipe didn’t include all spice. Was I supposed to add all spice somewhere? They certainly were divine without all spice. I used vegan butter instead of coconut oil cause I didn’t have any on hand. I used coconut yogurt instead of dairy yogurt. I didn’t add sugar on top. Still delicious and I will be making them again this week. 😉 I didn’t use liners I just used vegan butter to grease my muffin tray and it was fine. Sorry, I meant to click ‘5’ stars but when I went to correct the rating, the ‘Post Comment’ button was pushed instead (serves me right for posting from my phone where the button is right beside the rating! lol ). These are defintiely ‘5’ stars! Made with GF flour (Bob’s Red Mill 1:1) and they were delish!! I have 2 questions and I reread your blog & watched the video but didn’t see the answers in either. The recipe says to melt the coconut oil, have egg at room temp, but nothing about the yogurt or almond milk. Now I probably should have thought of this but I was happily following the recipe. Added yogurt, egg & milk & instantly the coconut oil started to solidify, a lot! Hi! Apologies for any confusion – the coconut oil should be melted and cooled so that it’s not hot, and then the vanilla can be added with the wet ingredients (per the instructions). We must’ve missed the vanilla in the video – sorry about that!